Well, I said I was gonna do it, and I gone and done it. That’s right, chums, the first shannoetry AudioBoo is now up for your listening enjoyment. I’ve been interested in checking out this micro podcasting medium for several months, and now that I have my handy-dandy iPhone, there’s no stopping me. The first boo is three minutes of hello, how ‘ya doin’, check out some nifty poetry/arts and culture in Calgary bits. But in the [not too distant] future, I plan to do some readings, maybe check in at a few events and post bits of them live, and experiment with audio like I’ve never (really, never) done before. Interested parties can check out the first official shannoetry boo here. I’ve talked up a few things, including Calgary’s long-running poetry reading series, Single Onion, High Performance Rodeo and an article from Write For Your Life, so you’ll find the necessary links below. And finally, for a little color, this photo (which is my boo image). 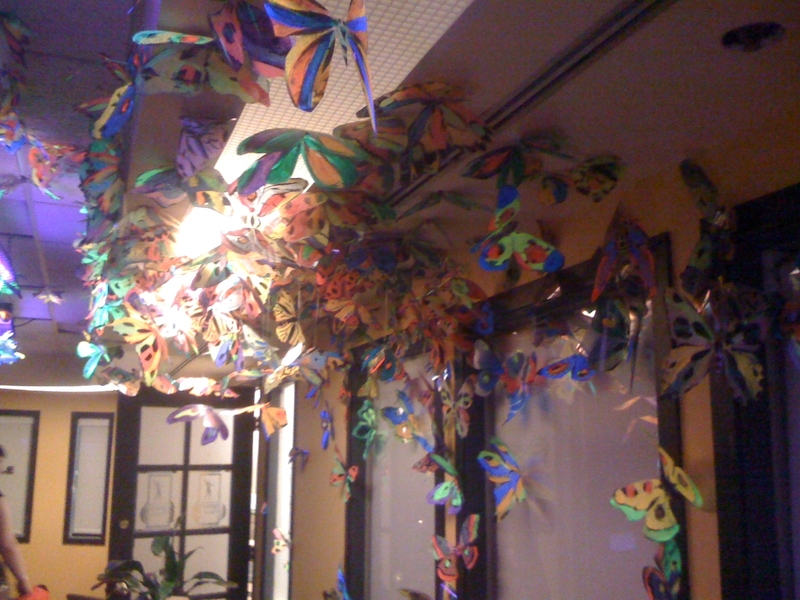 Took in a little more HPR midway on Friday night where they were exhibiting an array of black light-lit butterflies. Tres nifty.